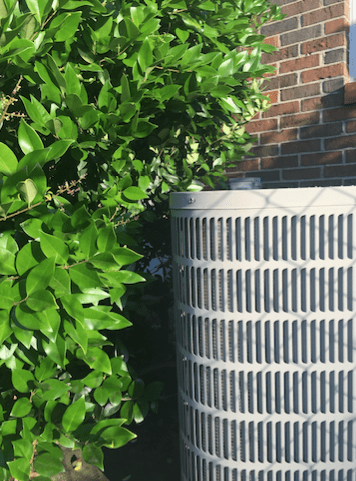 If your central air conditioner won’t turn on, there could be a cornucopia of issues causing it. (Trust us, we’ve seen it all). However, you don’t need a professional AC technician to solve all the problems you might be facing. OK, bear with us here. Did you make sure the thermostat was set to “COOL” and not “HEAT”? Even if it is set to COOL, try turning the temperature at least 5 degrees below the room temperature. If the thermostat isn’t working at all then you may have to change the batteries. If the thermostat still does not work after changing the batteries, there may be a wiring issue that a professional needs to solve. If the air conditioner’s breaker is tripped, then that explains why the AC won’t turn on. Your AC will (hopefully) turn on at this point. If the breaker does not “click” when you flip it or if the breaker trips immediately after you turn the AC back on, you have a bigger problem and should contact a technician. 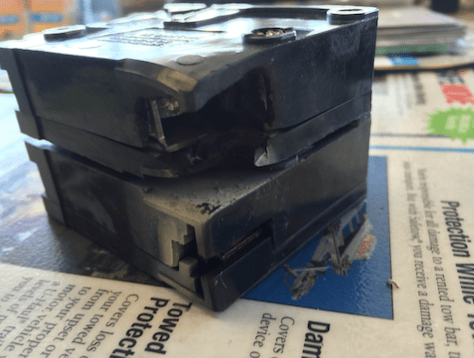 What causes the AC’s breaker to trip? Tons of things. Worst case scenario is that you have a short circuit somewhere in the wiring. Or it could be that the breaker itself has gone bad. Which isn’t a big deal, as replacing circuit breakers is relatively inexpensive. But, sometimes, the circuit breaker trips because the AC is pulling too much electrical current because it’s overheating. Let’s talk about why a clean and clear outdoor unit is so important. You see, in order for your AC system to cool your home, an indoor unit has to absorb heat from your indoor air and then “dump” that heat outside via the outdoor unit. However, if the outdoor unit is dirty or smothered by a bush, it struggles to release that heat, causing the unit to overheat and trip the breaker. So, after you flip the breaker back to “ON”, check the outside unit and make sure that it’s clean and clear of any shrubbery. 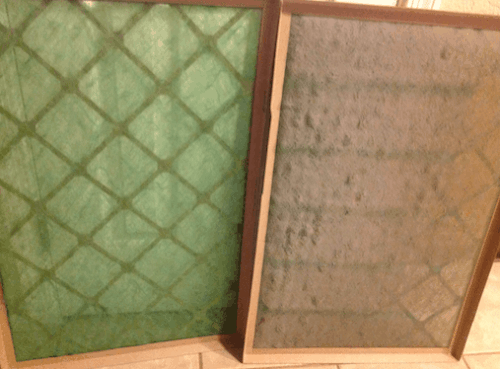 You’ll also want to check one more thing: the air filter. 1. Turn off your AC at the thermostat. 2. 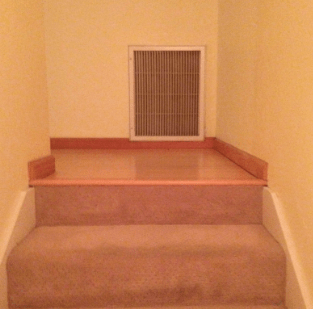 Find the return vent in your home. Return vent in the stairway. Your vent may be elsewhere. 4. Turn on the AC at the thermostat. If the filter isn’t dirty, go to step 4 below. Outdoor unit overheats— Since the AC can’t circulate enough air, the AC struggles to cool your home, meaning it runs constantly. 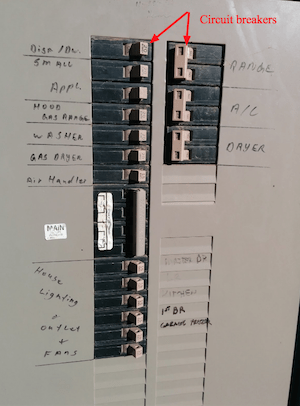 This constant running can cause the outdoor unit to overheat and trip the breaker. 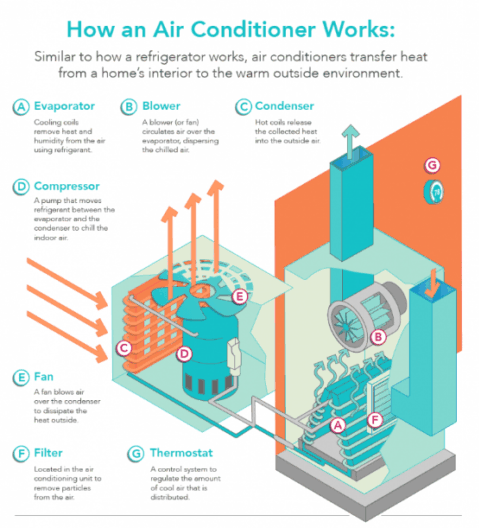 Indoor unit freezes— Your AC’s indoor unit has a cold copper coil (evaporator coil) that cools your indoor air. However, when airflow is reduced over this coil, it gets too cold, freezes, and eventually trips a safety switch, which shuts down the AC. Your air conditioner not only cools your home, it dehumidifies it, too. As your AC dehumidifies the air, water gathers on the cold copper coils and drops down into a condensate line, which exits outdoors. 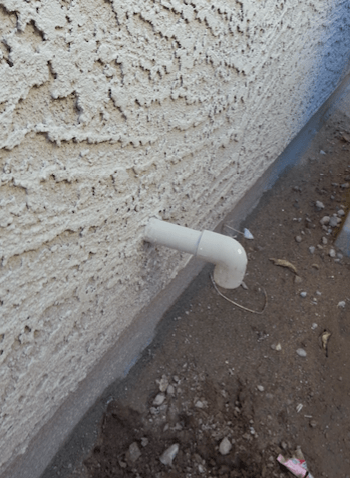 Unfortunately, over time this condensate line can get clogged with dust, mold and other gunk. When this happens, water backs up into the AC and trips a safety switch that shuts down the AC. Get a shop vac and some duct tape. Take both items out to the outdoor condensate line. It may be near your AC outdoor unit. Connect the vacuum to the condensate pipe and ensure you have tight seal using the duct tape. Turn on the vacuum and let it run for 3-5 minutes. Turn off the vacuum and check for any gunk in the vacuum. 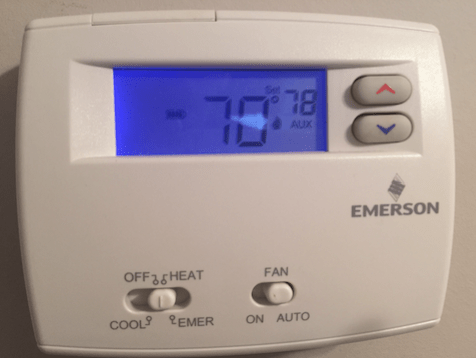 Doing the above may fix the problem, allowing the AC to turn back on. 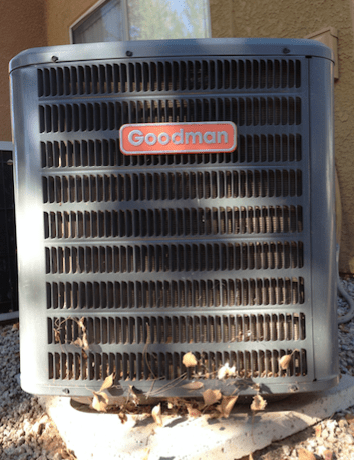 Need an AC repair in AZ? Call us! If you’ve exhausted all your DIY options, you’ll need a professional to find and fix the root problem. If you live in the Phoenix metro area in AZ, schedule an AC repair with Patrick Riley Services.